In the first part of this series, I introduced some of the basic components of Chinese characters that often indicate meaning. In this part, I’m going to continue with some more of the essential radicals that every learner should know. 鸟 is bird, and comes from a picture of a bird. In traditional Chinese it is 鳥. 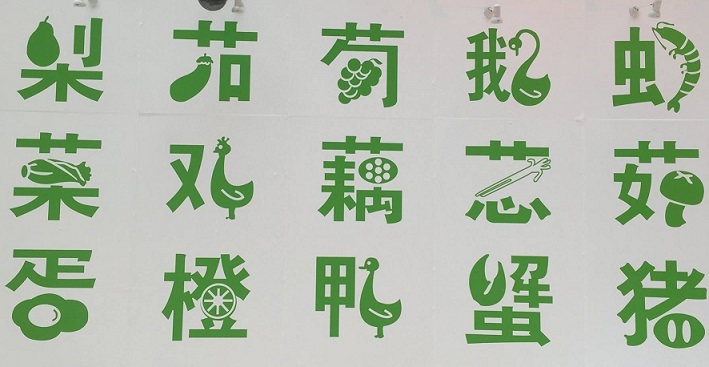 This radical appears in the characters for 鸡 (chicken) 鸭 (duck) 鸦 (crow) 鹅 (goose) and so on. 艹 this radical always appears on the top of characters. It means grass, and you’ll see it in a lot of the characters for plants, such as 草 (grass) 花 (flower) 茶 (tea) 药 (medicine) 菜 (vegetable) 荷 (lotus) etc. 禾 this component is also a character in its own right. It means grain, and it appears in 种 (seed/type/to plant) 利 (benefit/profit – grain+knife) 秋 (autumn) 税 (tax) and on the top of the character in 香 (fragrant). ⺮ this is also a pictographic component. It means bamboo, and comes from two twigs of bamboo. It is used in a number of characters for things that are made from bamboo (or used to be made of bamboo in ancient China), such as 管 (pipe/manage) 节 (joint/section) 笔 (writing brush/pen) 签 (thin bamboo stick, toothpick, to sign) 箱 (box) etc. 米 means rice and comes from a picture of grains of rice. It comes up in 料 (material) 粮 (grain) 粉 (powder) and 糊 (paste) etc. 饣(飠) is the radical that means food, and it appears in 饭 (rice) 饱 (to be full) 饮 (drink) 饿 (hungry) 饥 (starving) 馋 (greedy), and many more. Ok, that’s it for this part. Hope you learnt something new, and I’ll back tomorrow with the final part of these series to help you crack Chinese characters.